touch and the topology of galaxies"
A labyrinth is said, etymologically, to be multiple because it contains many folds. The multiple is not only what has many parts but also what is folded in many ways. The Chimney NYC is pleased to announce the solo exhibition of Mexican artist Mariana Garibay Raeke. 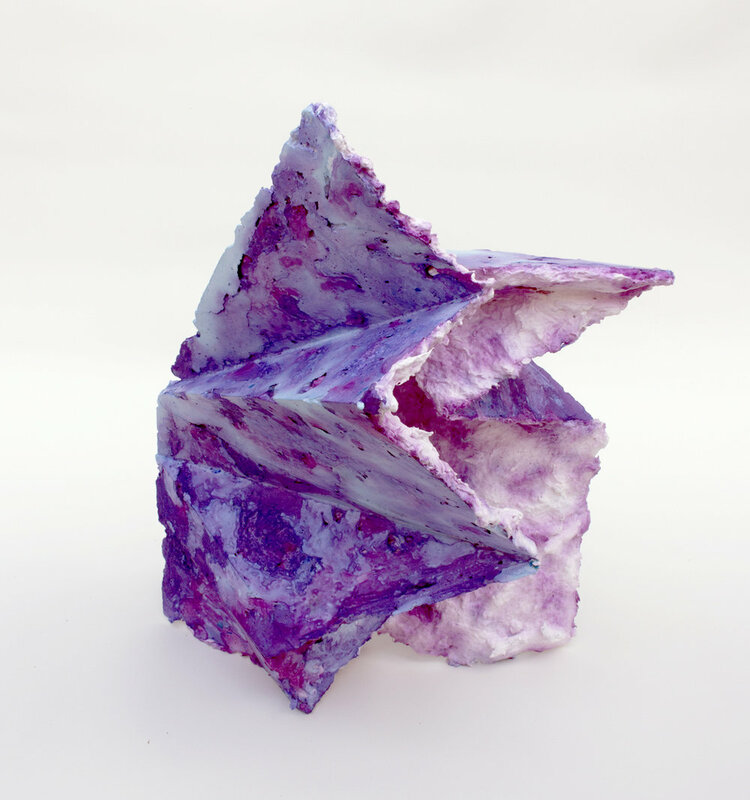 In "closing the space between us: touch and the topology of galaxies", Garibay Raeke explores folding as a way to transform flatness into geometric objects of innumerable configurations. The works parallel the motion of life itself through their various stages of folding and ‘being’. Each work is a pause, an in-between moment in a process of transformation that is guided by touch and material understanding. Through time and space, bodies and matter contract and expand to assert kaleidoscopic multiplicities, turning what is inside out and what is outside in. A folded surface can remind us that flatness, like everything else, is just a temporary state. Made primarily of paper pulp, plaster and pigment, the three distinct bodies of works occupy the three levels of the space. While complex geometrical tensions are explored with In and of Themselves, the free standing works on the ground, matter seems to liberate itself with softer forms and surfaces with the Measures of Timeless Expanse series installed on the vertical structures against the wall. Flat on the floor is Latent Overflow, a series of works made from the residue of the process organized by color. 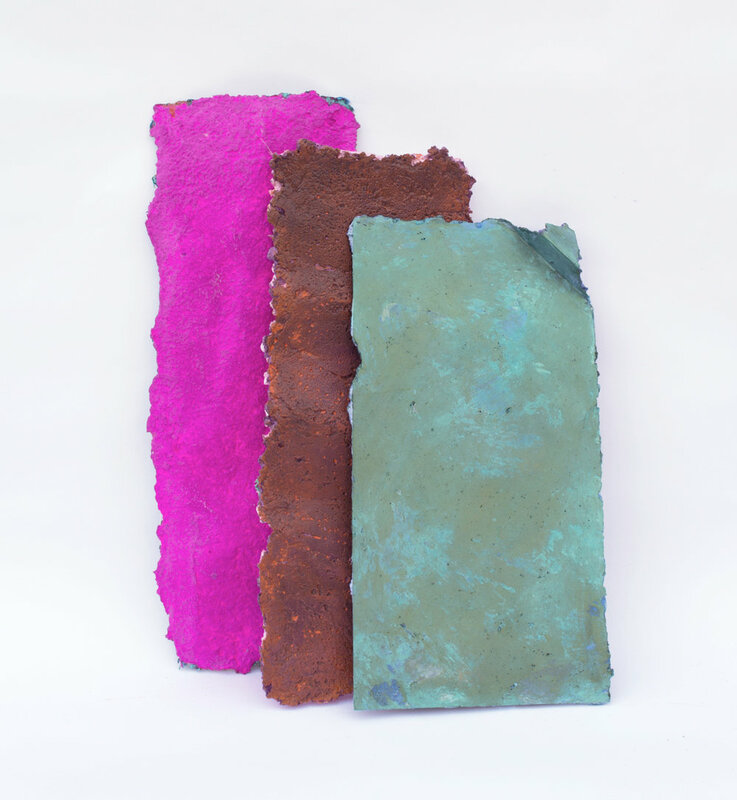 They constitute slabs of leftovers – echoing a constant recycling and transformative process. The sculptures are made with moulds that evoke commercial and standardized production systems. Garibay Raeke comments on today’s mass production and consumption system by revitalizing the source of production and downplaying its utilitarian function by allowing the agency of the material to decide for itself. Desires, bodies, artifacts, existences are increasingly subject to a cold mathematizing sameness. Garibay Raeke re-humanizes the mould to reveal its potential to generate a multitude of varying shapes, forms and colors. Our impermanent reality and its ever-shifting force can be bent, stretched; it can rise, twist, remain flat or it can crumple. It is a matter of actualizing the boundless creative potential of the point of origin in order to create open-ended forms that continuously renew themselves. 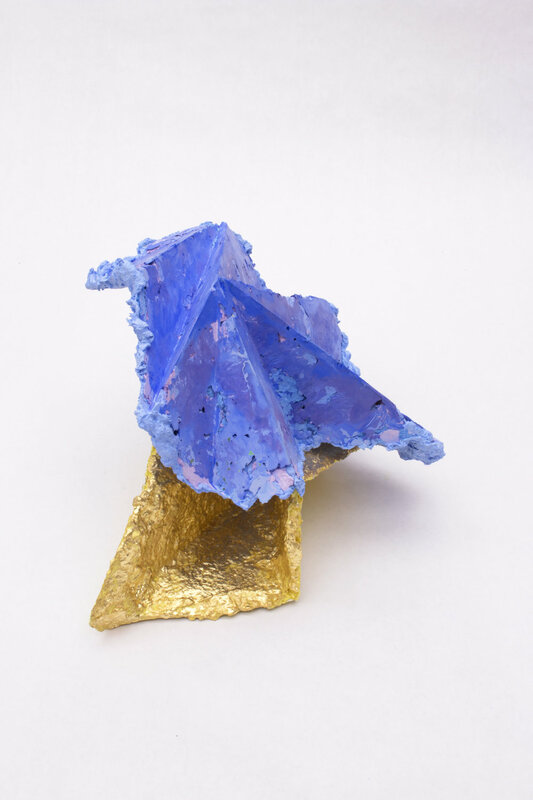 Garibay Raeke’s sculptures offer a multifaceted and variegated reality - deceiving at times but inherently interconnected through a single starting point. Mariana Garibay Raeke (b. Guadalajara, Mexico) completed her BFA at California College of the Arts, San Francisco (2012) and her MFA at Yale University School of Art, New Haven (2014) where she was awarded the Ralph Mayer Prize. Her solo exhibitions include “Polychromes”, Zughaus Gallery, Berkeley, CA (2012); “Life Elsewhere”, The Consulate General of Mexico, San Francisco, CA (2007); “Translations”, de Young Art Center, San Francisco, CA (2005). Her work has been included in group exhibitions at the Young Art Center, The Consulate General of Mexico, SFMOMA Artist Gallery, all in San Francisco; the MACLA/Movimiento de Arte y Cultura Latino Americana, San Jose; Harvey/Meadows Gallery, Aspen; Instituto Cervantes, New York; Transmitter, Brooklyn; Bruce High Quality Foundation, New York; Oakland Museum of California, Oakland, among others. Garibay Raeke has participated in residency at the Museum of Arts and Design, New York (2017), Anderson Ranch Arts Center, Snowmass, CO (2017), the Kala Art Institute, Berkeley and the Fine Arts Museum of San Francisco, San Francisco (2005). She was a nominee for the Rema Hort Mann grants, New York (2015) and was included in Smack Mellon Hot Picks (2015). She was awarded several scholarship, among which the California College of the Arts President’s Scholarship (2011). She is a founding member of Colectivo Grupo and co-founder and editor of Asteroid and Asterism.